A pair of Boston Globe reporters reflect on the Valedictorians Project, their investigation into former Boston high school standouts who seem to have been let down by the district. Looking at the smiling faces of high school valedictorians published annually in the Boston Globe, it’s easy to imagine bright futures ahead for them. But, as the Globe revealed in its recent five-part Valedictorians Project, that expectation is not borne out by actual experiences – at least not when it comes to valedictorians from Boston’s traditional high schools. Among the nearly 100 Boston Public Schools (BPS) valedictorians the paper tracked down from 2005 to 2007, many are not succeeding as they or others had expected them too. Forty percent of them currently make $50,000 or less each year. None of the many who wanted to become doctors have done so — yet. By comparison, valedictorians from nearby suburbs and Boston’s elite “exam” schools are faring much better. 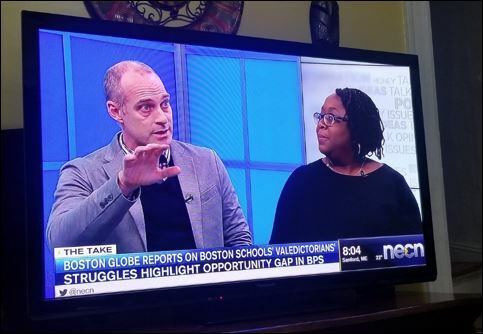 The Globe project has attracted enormous attention and praise and has generated renewed attention about changes that might need to be made to Boston’s education system. Next week, the Boston Public Library is hosting an event, Where Do We Go From Here?, featuring reporters and former valedictorians. For me, the third section about Boston’s infamous “exam” school system is the most powerful. At nearly every stage, black and brown kids are left out of the pipeline to better schools and stronger programs. And there’s little indication that things have gotten much better in the intervening years. In the following Q & A, two of the three core journalists on the project tell us about their work and their findings. They aren’t education reporters. When they started, they didn’t know the story would end up focusing so much on education. And it was much harder to locate the former students than anyone imagined. (Not everyone is on social media, it turns out.) But they helped produce a remarkably powerful piece of journalism. 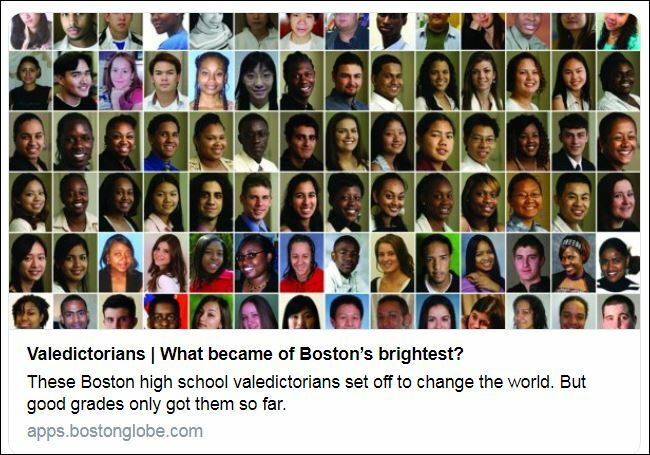 Since 2005, the Boston Globe has published the names and faces of the city’s valedictorians. This year, they decided to go back and see how the students fared after graduation. Alexander Russo: Who gets the gold star for thinking of doing this project? Malcolm Gay: We’ve been doing ‘Faces of Excellence’ every year since 2005, which is a spread of valedictorians in the city. Starting in 2015-2016, the paper made one of the priorities in the newsroom to interrogate inequality and social mobility. At the very least, people thought we could do an interesting follow-up on these valedictorians to see ‘where are they now?’ But there was a deeper sense that their stories might tell us something profound about social mobility and inequality in Boston the 21st century. AR: How did you two — an arts reporter and a social justice and race reporter — get assigned to this, as opposed to the education team or the investigative team? Meghan Irons: [laughter] That is a really good question. If you’ve looked at both of our bodies of work, you’ll see that we are deeply committed to issues of equity. So there was a great synergy of reporters from different backgrounds that the Globe felt could spend the time to delve into these pieces. But at the onset of this project, I don’t think we were all thinking this was going to end up being an education project. We really didn’t know where the stories were going to take us. We started just asking questions about social mobility, inequality, and equity. And we realized that education was a key component where we needed to devote our attention. AR: What experiences did you bring to the project, in terms of your own high school and postsecondary years or your own interactions with the education systems since then? MI: I graduated from a traditional Boston public high school, participated in a pre-college education enrichment program, and went to an elite private college feeling that my urban education was subpar. But this project was not about me, so the focus had to be on the valedictorians. MG: It’s hard to report on education issues and not be reminded of one’s own experiences. In this case, it heightened my awareness of the role families and social structures play in success. Reporters Malcolm Gay (left) and Meghan Irons (right) discuss their project on local cable news. AR: Why focus on valedictorians as opposed to any other group of students? MG: One of the problems of writing about social mobility or inequality is that it’s kind of abstract or nebulous. It’s hard to actually make real. One of the things that using the lens of the valedictorians — people that are tried and true and tested and proven that if given the tools they really can excel — is that when you see them run up against these obstacles, it almost becomes this sort of X-ray or infrared lens through which you can see the actual structural impediments as they exist in the landscape. AR: What story, statistic, or sentence from the project moves you the most? MI: The most gripping one is the one Malcolm did on students who want to be doctors encountering numerous barriers. You can’t walk away from those stories without feeling the system has let them down. I am also moved by the last line in the Michael Blackwood story, when his son declared that he, too, wants to become a doctor. AR: What was it like delving into education for you, as reporters who don’t cover the topic as a beat? MG: Education is a complicated beast of an issue. One thing that makes education reporting both very difficult, while at the same time allowing for perspective, is that people are extremely passionate about schools. Part of the issue is finding individual sources that kind of speak through the noise. Trying to find the through line through all these various constituencies is a real challenge. That said, there’s a wealth of information out there. The question is: how do you determine what information to concentrate on, and how do you see the true contours of the story? AR: What did you wish you’d known at the start of the project – or had to learn the hard way? MI: We didn’t know what we were going to find, but we did have some basic questions when we started. Are these kids better off than their parents? Did our school system prepare them properly so that they could succeed in college? I think when you start with a few questions to frame what it is you’re looking for, it makes the reporting much more focused and much more targeted. We knew we didn’t want to spend our time spinning our wheels. MG: It was also a very smart idea on the part of the editors that we interviewed 65 suburban valedictorians from randomly selected schools around Greater Boston. Some of them were from affluent communities, some of them were from working-class communities, some of them were from middle-class communities. What that gave us was a kind of control group. We didn’t want to be deeming people successes or failures. 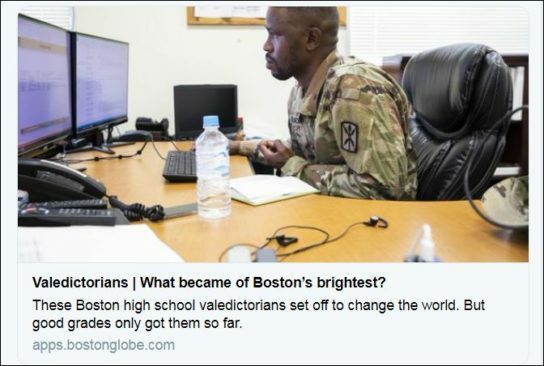 I could never say that Boston valedictorians are not successful. What I can tell you is that in terms of financial might, in terms of degrees earned, they are outperformed by suburban valedictorians. AR: Speaking of editors, what role did they play in shaping and bringing this project to completion? MI: There were a lot of editors on this project. It was very important to have a team of people. There were a lot of eyes and ears, a lot of opinions, and a lot of pathways to the product that we have now. It was important to have people who know how to do projects. MG: The editorial input of the editors was absolutely critical, especially when it came to balancing things out. The student profiles aren’t all educational stories. We had to be careful to make sure each of the stories stuck to its lane. They had to have a very strong narrative spine and not wander too much. We didn’t want too much overlap. That was a big part of the editing and writing process. We wanted distinct voices. AR: What would you say to other reporters or newsrooms who want to try something like this? MI: I would say you might not have a whole year to do a project like this, but you can begin to start by asking some really simple questions and press your urban high school district for answers to those questions. Look at the data and find people. There’s no doubt that regular high schools in large cities do not offer the same opportunities — either curriculum or faculty/advisor support — as exam schools do. But in addition, in (for instance) Chicago, that means that the most-prepared 10 or 15% of 8th grade students are diverted to the exam schools, and the regular school valedictorians are not the top students in the system, but rather the top students in the individual neighborhood schools. After all, each school must have a valedictorian. Some years back, the valedictorian at one large Chicago high school was found to be functionally illiterate — yet she had the highest grade point average in the school. There, you can see both of these dynamics tragically at work: the student was in a school without any high-performing students, so she rose to the top of that school; and yet, her teachers had done nothing to address her lack of reading skills.